Grain quality is critical to all the roleplayers in the grain value chain – from the producer to the consumer. Grain quality is a term that refers to the quality of the grain. However, quality depends on what the grain is used for. In ethanol production, for example, the chemical composition of grain, such as the starch content, is important. In food and feed production, properties like protein, oil and carbohydrates are important. In the milling industry, the health of the grain is the most important factor, and to producers who use seed for planting, a high germination percentage, the growth vigour of seed and seed dormancy are the main quality properties to be taken into account. To consumers, properties like colour and flavour are important. The quality of grain is determined by physically grading it, when properties are determined visually and with the aid of instruments. During this process, the grain’s suitability for its intended purpose and the grade are determined, and these are linked directly to the value of the grain. The buyer of the grain decides on the basis of the grading whether he can use the grain for his intended manufacturing and what he can pay for it. Grain quality is therefore an essential element of the entire value chain to produce a quality product, store, process and eventually supply it to the consumer’s use. In general, wheat must be acceptable for consumption by people and animals. It should also be clean, ripe, and free of foreign matter and damage. The overall quality of grain is affected by various factors, including cultivation practices, time of harvest and harvesting practices, handling, storage and transport practices. Grain quality to a great extent depends on the type of grain, genetics, cultivation practice and handling and storage of the grain. Percentage of coloured, broken and damaged grains. Presence of insects and fungi. Generally speaking the quality of wheat can be divided further into three main groups: (i) botanical (species and cultivars); (ii) physical, and (iii) chemical characteristics. Physical properties of wheat quality include grain mass, hardness, grain size and shape and colour. Chemical characteristics of wheat include moisture content, protein (gluten) content, amylase content and fibre content. As was mentioned above, the buyer of the grain takes the different properties into account when he has to decide whether he will buy the grain and what he wants to pay for it. Grain grading and specification systems for grain ensure that the parties involved in the production, storage and processing of grain can handle, trade and process grain that complies with the required standards or properties. In most countries the grading of grain depends on four main properties, namely (1) Hectolitre mass, (ii) moisture content, (iii) foreign matter, and (iv) damaged grains. Hectolitre mass (HLM), also known as volumetric weight, is regarded as the most common and easiest way of quantifying wheat. 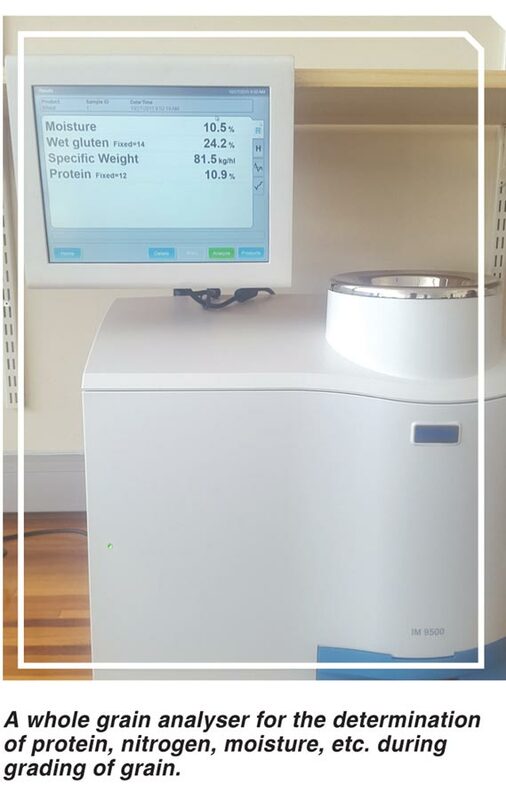 It measures the grain mass density and is expressed as mass per volume. It is an important quality property because it provides an estimate of meal yield. The HLM of grain is influenced by many factors, including climatic conditions during the growth period of the grain, frost damage, climatic conditions during harvest and foreign matter in the grain. The basic factors affecting the HLM are grain size and shape, grain density, maturity of wheat, diseases and cultivar. 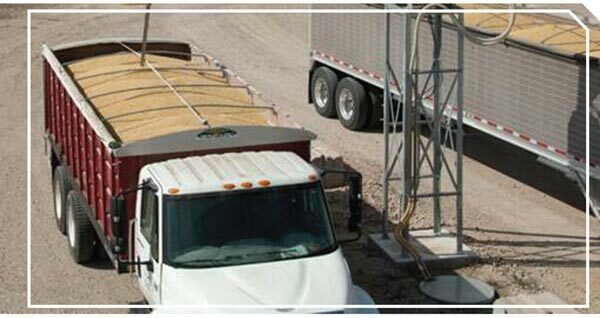 Moisture content is one of the main grading factors in grain, as it is a critical factor in grain storage. It is an indication of the water per unit mass of grain and is expressed on a percentage basis. Moisture content does not affect grain quality directly, but influences quality, as grain spoils at a moisture content higher than that recommended for storage. The maximum moisture at which wheat, barley and oats can be stored is 13%, for canola it is 8% and for maize 14%. Foreign matter is material other than grain, for instance sand, stones, plastic particles, metals and glass that contaminates grain. In the grain industry, the presence of foreign matter exceeding the permissible foreign matter measure leads to lower grades, lower prices or the rejection of the grain. This is determined by physically removing foreign matter by hand from a sample. Each grade of grain is subject to a limit for foreign matter. The maximum permissible foreign matter in wheat is 1% for grades 1 to 3, and 3% for the utility grade. Damaged grains are those grains that are visually detected to be damaged and they have a negative effect on the value of the grain. Grains can be damaged by insects, heat, budding, frost, diseases and poor grain fill. This is determined by physically removing damaged grains by hand from a sample. The number of damaged grains for each grade is limited. Wheat, for example, may contain a maximum of 2% damaged grains of the total weight. Field fungus contamination (maximum 2%). No live insects that can damage the grain may be present. Other specifications include broken grain, milling quality, seed viability and nutritional value. The quality of grain is of critical importance throughout the grain value chain. The producer must deliver grain that complies with the required specifications and is remunerated for the grain he delivers in accordance with its quality. The storage facility must determine the quality of the grain to establish whether it complies with the required standards and then store it securely until it can be sent for processing. The processor requires grain of a fixed quality that complies with his needs for manufacturing a specific product that meets the consumer’s demand. Article submitted by Johan Lusse. Manager: Grain Services, Overberg Agri Operations. For more information, send an email to johanl@overbergagri.co.za.